July evaporated quickly into hot days that lent life to the garden. 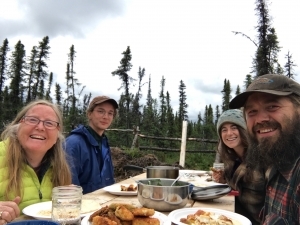 This week, in early August, we find ourselves asking, “What on earth happened to the summer?” These reviews of the month are a great opportunity to sit down and think about the trial and accomplishments endured during each chapter of homestead living. July was full of homestead guests including Morgan’s mom. Katy made her second trip to the homestead. It is always a joy to spend time with family in our home. We enjoyed her insight into our forest habitat, her help with chores, and the delectable treats she packed in from Texas (peaches and Okra make a Texas girl happy). 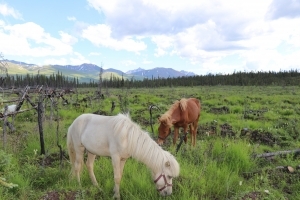 Together, Margaret and Katy extended the fence for pastures, garden, and airstrip. 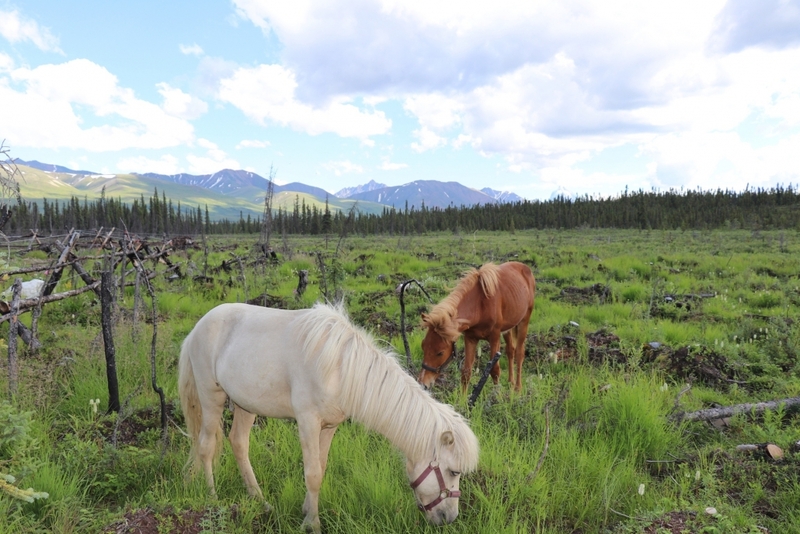 All fencing was converted to 3-strand wire for better horse, moose, and bear deterrent. 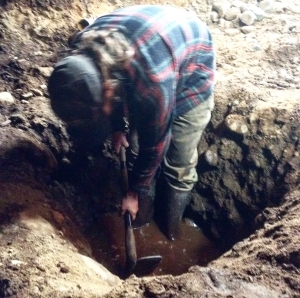 While they fenced, WWOOFer Andrea and Morgan worked on further digging out our root cellar. Most exciting, Morgan struck water for our well at about 6 feet below grade! Once the well if fully developed means in cabin water access. No chopping daily holes in winter ice or hauling 5 gallon buckets. There is much work to be done to complete this task, but the end is nearly in sight. The greatest excitement of the month occurred in Late July. Two new additions, colts Svanur (Icelandic for Swan) and Vinur (Icelandic for Friend), arrived at the homestead. 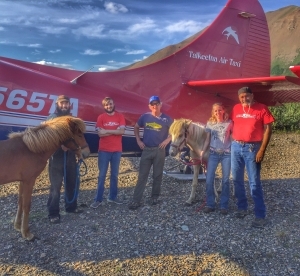 With a team including the always wonderful Talkeetna Air Taxi and new friends Tammy and Roy from On the Road Again Transport, these brave animals flew out to a remote airstrip 15 miles from the homestead. 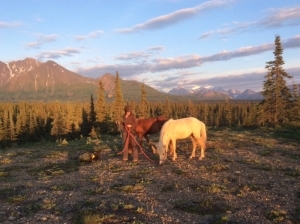 Margaret met Morgan and the animals at that remote strip, and the crew of 5 (Margaret, Morgan, Svanur, Vinur, and Magpie) trekked through the night to get back to the homestead at 4:30 in the morning. Good thing it never gets dark! The new horses have adjusted well to their new surroundings. Currently, they are right around the homestead on pasture and in the barn as we bond and continue to train them. 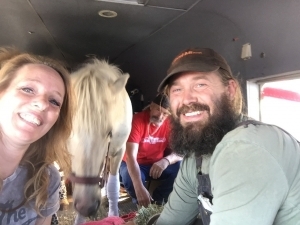 A fantastic training foundation has been instilled by Fitjamyri Farm of British Colombia and Tammy and Roy of On the Road Transport. 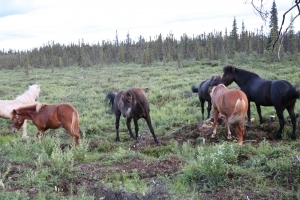 Svanur and Vinur have met the other horses, however it will take a while for them to be fully integrated into the rest of the herd. We will keep you updated on their progress. Additionally, Margaret got a lot of carving done. 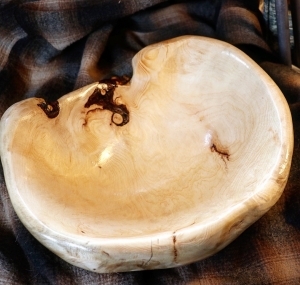 Here is a hand-carved Spruce Burl custom bowl for an art collector. These burls are acquired on winter trapline outings. We both love creating things from the natural world around us. Please contact us for our current selection of goods and pricing. It is early August now. Darkness, though brief, has arrived. Summer will soon fade into a dream as we rush headfirst into fall. 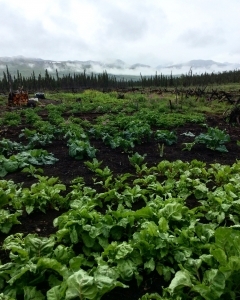 Cooler temperatures, the garden harvest, and the rush to complete all of our summer projects. We are just starting to fill our bookings calendar for the Summer of 2019. We would love to host you! 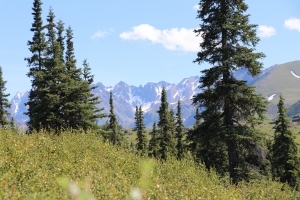 Please get in touch and let us know how we can design your Alaska homestead vacation. Also, we are hoping to update our blog more regularly. Let us know the kinds of posts you would be interested in.